The quest for knowledge can become a fact finding mission without an end, unless you know the right place to search. I am married to a man who is my complete opposite. As a science brained person, he loves logical progression as he acquires knowledge (a+b=c). As an artsy creative type person, I love to use my senses and intuition to learn. We have been known to frustrate one another because we cannot explain ourselves so that the other gets what we are saying. As newlyweds this caused a great deal of friction in our marriage. Until I discovered this verse in James, and realized if we were ever to understand one another, we would need the Holy Spirit to help us communicate. It takes His wisdom to show us what is behavioral, and what has been hardwired into our design. God has never failed to shine His truth and wisdom on any situation where I have first waited for Him to speak. Heartbreaking, traumatic or at a crossroads—whatever the circumstance—His wisdom was the exact fit for what I needed to know, and for where I needed to go from there. I can honestly say I am still married today because of God’s wisdom, love, grace and guidance through some very turbulent waters. Pause and Apply: Do I tend to leap before thinking? 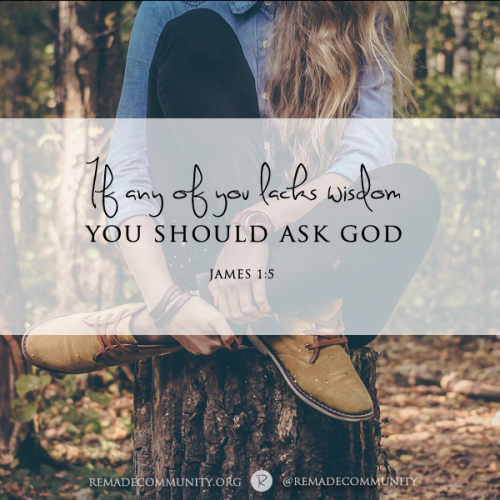 What do I need to bring before God so He can speak wisdom into it? Prayer: Lord, You give the gift of wisdom to all who ask. I am asking today. Help me navigate the choppy waters ahead in a way that pleases You. The post Wisdom Seekers first appeared on Remade.